Alongside an innovative update to our growing Kitchen Sinks and Taps Directory, we are now proud to offer a stylish and affordable range of modern kitchen worktops. 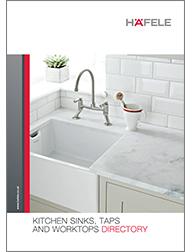 Providing a range of finishes, materials and price points, this is your go-to guide for all your worktop, sink and tap needs. View our products in our online catalogue or browse our e-catalogue.